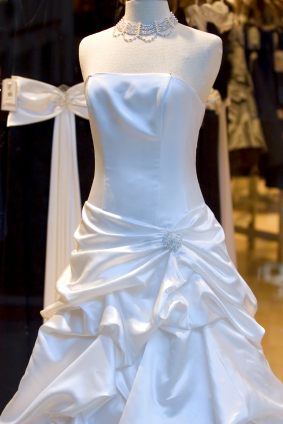 You'll be in the spotlight ALL day, so it's important to keep your wedding gown clean and fresh looking. We've got 8 great tips to help you do just that! Before the event, as you are getting ready, opt for water instead of soda or coffee. Not only will it help keep you hydrated, it won't stain like coffee or soda in the event you spill you a little. Have someone make sure the car you are riding in is clean. Check the seats, floor, and running boards carefully for dirt and debris that can be picked up by your gown as you get in and out of the car. Consider covering the seat and floor with a sheet. Remove the stamens from the flowers in your bouquet. If the flowers you've chosen for your bouquet have stamens, it's possible they could stain your dress. Ask your florist to remove remove them before assembling your bouquet. Pack a towel in your bridal bag. As you touch up your makeup throughout the day and evening, use the towel to cover your shoulder and chest. This will protect your gown in case you drop your lipstick or makeup brush. Use and antiperspirant deodorant combination. The antiperspirant will protect your gown from perspiration. Pack steamer in you bridal bag. This will enable you to make quick touch ups to the gown while you are at the venue. If you don't have a steamer, a travel iron will work. However, you'll want to make sure you put the iron on the lowest/coolest setting available so you do not scorch the fabric. Use a garment bag or protective cover for your gown. Whether you are dressing at the venue, or changing out of your gown into another outfit after the event, be sure to use a garment bag or protective cover when transporting your gown from place to place. It's easy to brush the gown up against a dirty surface unknowingly. After the ceremony, be sure to bustle the back of your gown if you have a train. This will prevent people from stepping on the back of the gown and will it also keep it from dragging on the floor more than necessary. As you walk, gently pick up the front sides of your gown to prevent it from dragging on the floor, as well! Tell us what us we should include and we'll update our list! For wedding favors and accessories, check out WhereBridesGo.com!